Gingerbread was always a favorite dessert in our house when I young. 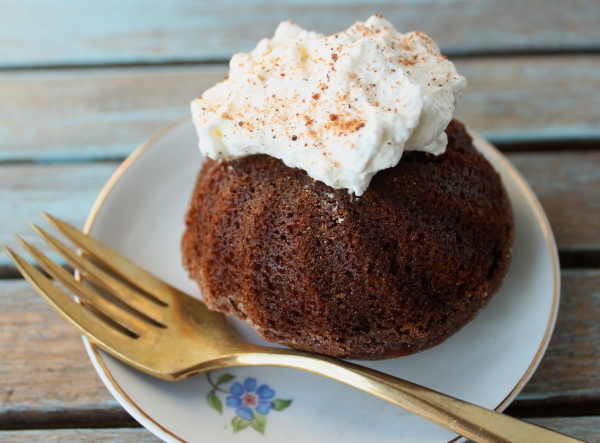 My mom loves anything with ginger, so I think she would love these little mini gingerbread cakes with a rum whipped cream. These are for you, mom! 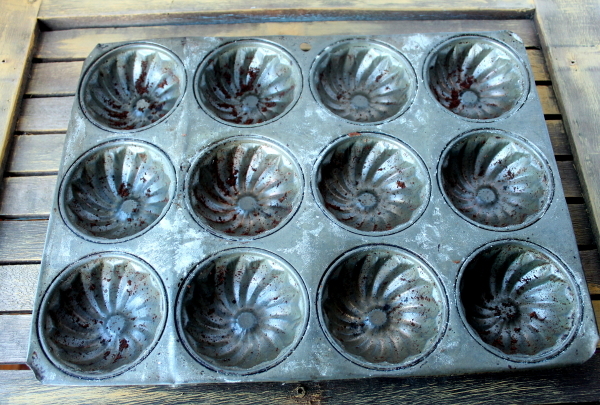 I was going to make these in mini bundt pans, but then came across my beautiful antique cake mold that I haven’t used in quite a while. The cakes turned out beautiful! The gingerbread cakes freeze beautifully. You can keep a batch on hand for a holiday dessert, and all you will have to do is whip up some cream. The rum added to the whipped cream is heavenly with the cakes, and I always sprinkle on a little nutmeg over the whipped cream before serving for a festive flair and added flavor. Heat oven to 350 degrees. Grease and flour mini cake pans (recipe makes about 1-1/2 dozen, depending on size of pan). In large mixer bowl beat together sugar, molasses, butter, and eggs until smooth. Mix in flour, baking soda, ginger, cinnamon, cloves, nutmeg, and salt, alternately with the boiling water. Pour batter into prepared pans. Bake for 14-18 minutes (depending on size of your mini pans) or until a tester inserted in the center comes out clean. Cool cakes in pan about 5 minutes, then carefully loosen edges and remove from pan; place on cooling rack. To serve, add a dollop of the rum whipped cream to the top of each cake and sprinkle with additional nutmeg. Makes about 1-1/2 dozen small cakes (if you want to make one large cake instead, bake in a bundt pan for about 35-40 minutes). Rum Whipped Cream: Beat together 1/2 cup whipping cream, 2 Tablespoons confectioner’s sugar, and 1-2 teaspoons rum until soft peaks form. (You can substitute 1/4 teaspoon rum extract for the rum). If you like lots of whipped cream, just double the recipe! Thanks, Brett! I love all my old molds, pans, and utensils. Some belonged to my mom or grandmother, but I have also found a lot at antique stores. One of my other favorites is an antique French soup ladle. I am in search of one of those old glass nut choppers with the crank handle. I use mine all the time and now Kara wants one, too.